Established 10th July 2015, Basin and Range National Monument is named after the dominant landscape of Nevada; wide basins separating long but narrow mountain ranges, scenery typical of the Great Basin Desert that extends across most of the state. Many parts of Nevada are similar in appearance and could equally well be part of such a monument, but the area chosen, north and west of Crystal Springs along US 93, has the added interest of many ancient petroglyphs, found on rock outcrops at the edge of some of the foothills. The earliest are 4,000 years old. Also of note are several plant species endemic to this region, relics from abandoned mines, and a variety of rock formations including arches and caves. 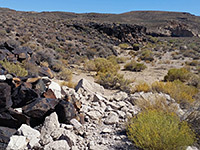 Apart from the petroglyphs, however, there is nothing of special interest, and activities are the usual hiking, camping, hunting and backcountry exploring offered by all of Nevada's public lands, though there is one developing, man-made attraction in City, a large-scale artwork by Michael Heizer, located in one of the wide basins (Garden Valley), and under construction since 1972. Visitor facilities are likely to remain virtually non-existent, as the monument is managed by the BLM rather than the NPS, its primary purpose being to protect the land, by excluding such activities as mining and forestry. 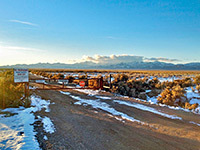 The national monument lies towards the south edge of the Great Basin Desert, close to the border with the hotter Mojave Desert. Its southernmost section (the detached Shooting Gallery Unit), is home to strands of the Joshua tree, one of the characteristic plants of the Mojave, but most of the preserve is dominated by the ubiquitous sagebrush, giving way to pinyon and juniper pines on the lower mountain slopes, and ponderosa pine higher up - elevations peak at nearly 9,000 feet. The main section of the national monument is bordered by two series of mountains, the Mount Irish Range to the south and the longer Seaman Range to the east. At the center are the narrower Golden Gate Range, while the similarly-sized Worthington Range lies to the southwest. Between these peaks, the majority of the land is largely flat, around 5,000 feet in elevation, crossed by long, unpaved roads, most of which are well maintained and suitable for regular vehicles. A little further west, the Quinn Canyon and Grant ranges contain higher summits, and all is also public land, part of the Humboldt National Forest. Many small washes drain the mountains, ending in seasonal lakes on the valley floors, while one larger waterway, the White River, runs close by to the east, briefly through a protruding section of the monument, location of the largest collection of petroglyphs. Apart from the White River Narrows petroglyph panels beside Hwy 318 on the east edge of the national monument, all access is via gravel or dirt tracks, and there are five main approaches, four starting along Hwy 318 in the east and one along Hwy 375 to the south - see map. This latter is Shadow Road, forking northwards near the tiny settlement of Rachel; the track crosses Sand Spring Valley, running partly beneath the west face of the Worthington Mountains, and enters the monument after 25 miles, moving over a low divide into Garden Valley. On Hwy 318, the northernmost route is Adaven Road, which passes close to a riparian section of the White River (Wayne Kirch Wildlife Management Area) and later turns south, into the north edge of Garden Valley. The next access is Timber Mountain Pass Road, through the northern reaches of the Seaman Range and into Coal Valley, which is the largest flat, open area in the monument, and is also accessed by the next side road south - Seaman Wash Road, which is a little longer but generally smoother than Timber Mountain Pass Road. The final route is Mail Summit Road, rising to a minor pass at 5,648 feet, then descending to the south edge of Coal Valley. These five roads access the vast interior of the national monument, though most visitors are here to see petroglyphs, which are found in three main locations, all close the edge of the preserve; White River Narrows, Mount Irish, and Shooting Gallery. The most visited location in Basin and Range National Monument is the White River Narrows Archaeological District along Hwy 318 (23 miles north of Crystal Springs). The highway follows the course of the White River for some 50 miles, mostly through broad valleys, but at one point the drainage becomes enclosed by cliffs and steep slopes of dark-colored rhyolite and lighter tuff, up to 300 feet high, and many rock faces are adorned with petroglyphs, the majority along a 2.6 mile side road (a former alignment of the highway), which follows the stony canyon floor. Rock art locations include Main (Amphitheater), Martian Home, Calendar Fence, Ash Hill and Cane Site A. The petroglyphs are in some places mixed with pioneer signatures from the 1800s and early 1900s, and also with quite a lot of modern graffiti, a consequence of the easy access, just off the main road. Petroglyph designs include animals, hunters, and many kinds of shapes and abstract figures. 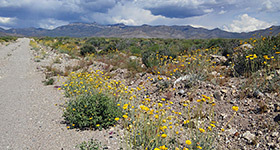 Some are along a side drainage to the southeast, originally named Wrong Way Canyon, now known as Valley of Faces Canyon. The unsignposted, unpaved Logan Canyon Road forks off Hwy 318 to the west, 2.5 miles north of Crystal Springs, and reaches a junction with Silver Canyon Road after 7 miles. The left (south) fork is marked with a BLM sign, at the edge of the Mount Irish petroglyph area; the first location, just after the intersection, is the small Echo Rock site, beyond which the road continues to a larger group of panels after 9 miles. All of the route is somewhat rough but does not generally require a 4WD vehicle. Echo Rock is an isolated group of boulders just south of the road, between two channels of the (dry) Logan Creek; the rock art is found on two adjacent, flat, north-facing surfaces, the taller about 15 feet high. 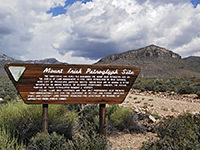 This general area is right on the west edge of Pahranagat Valley, in the foothills of the Mount Irish Range at elevation 5,600 feet, and the designs are found on the weathered surfaces of rhyolite boulders, surrounded by flattish, bushy land. The three largest groups of petroglyphs (Paiute Rocks, Shaman Hill, Shaman Knob) are described in a BLM brochure, and there are many lesser panels in the vicinity. First reached is Paiute Rocks, a pile of boulders right beside the road, to the north, next to another BLM sign. The other two are close by; along the main track a quarter of a mile then south for a shorter distance on a lesser track, which leads to the valley of Logan Creek. Shaman Knob is a pile of boulders on the east side of the road, while Shaman Hill is a more extensive area to the west. In all three locations, some of the best petroglyphs are marked with iron signs. 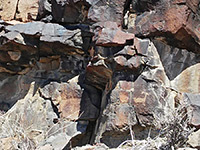 The third main petroglyph area in Basin and Range National Monument is the detached Shooting Gallery Unit, west of Alamo along US 93, reached by the unpaved Curtis Canyon Road (forking west off Richardville Road), a 9 mile route that is rather rough in places, and has two steep sections. The final quarter of a mile is on a lesser, more uneven track which descends into a little hollow. 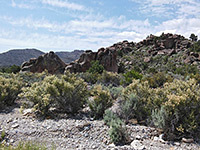 From the BLM parking area, a short trail heads off to the west, crosses a dry drainage, then divides in front of a gently-sloping hillside covered with numerous boulder piles. The petroglyphs are found on many of the boulders, and extend about half a mile west and north; there are hundreds of figures here though none are marked with signs, so it may take some time to locate a good selection.